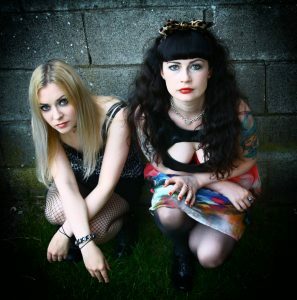 Punk two-piece Vulpynes are only three singles old, but already look a good bet for Dublin music’s next big thing. So what has the lairy pair making waves in London and Berlin? DUBLINERS VULPYNES had an inauspicious start. Formed after drummer/ vocalist Kaz Millar placed an advert on Boards.ie looking to form a band (future partner in crime Maeve Molly McKernan was the first to reply), the post eventually resulted in a four-piece. They played only covers, and lasted mere days. Millar and McKernan had felt something click, though, and after a brief search for a bassist, decided to start making original material, and to go it alone. Their sound takes much of its inspiration from the 90s. It’s raw, nodding distinctly to acts like Hole, Alice in Chains, L7 and Soundgarden. Riddled with reverb, abrasive and fearless, it comes from a band dynamic that was very much full speed ahead from the off. While relatively underground at least for the uninitiated (it’s based largely around a small handful of labels and venues, though there are surprisingly numerous bands), Dublin has long had a powerful and close-knit punk scene, based around lairy nights out, an enticing community spirit and supportive culture. While they connected specifically in order to form the band, the stories of Millar and McKernan’s journeys with punk are surprisingly similar. 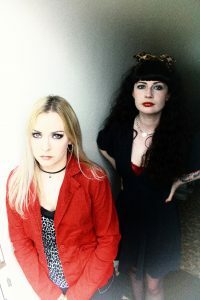 McKernan’s mum introduced her to bands like L7 and Hole at a young age, and now shows her support for Vulpynes by drawing, producing stunning illustrations of the pair as skeletons, or foxes. Millar’s older sister channeled Nirvana and Alice in Chains into her life. Much of the band’s creative spark now happens in a practice room in Whitehall. Shared with several other bands, the space is “too hot in summer and too cold in winter,” but enough to allow the pair to work. The songs come together quickly. So far, the singles have been a stark statement. ‘OCD’ is a brash if oddly-positive ode to the condition, with abrasive riffs and throat-battering lyrics. 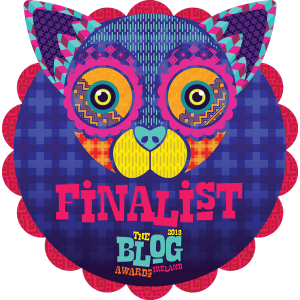 ‘Terry Said’ is a little less direct, written about a stranger in a Dublin bar, with almost sneeringly dank choruses. The newest release, ‘Silica’ is the best yet, unapologetically in your face and bitter, with deep-toned chords that almost twist McKernan’s guitar into a bass-like snarl. The future is bright for the pair, and in the short term will see the boisterous two-piece playing extensively over Christmas and New Year, including a Hot Press showcase in January. In passing, McKernan mentions two key chords on which she bases much of her guitar part. It’s an aesthetic, of course, but also distinctly punk rock, about being raw, direct and sticking to a tone as much as delivering a melody. The passion for their project is clear to see in everything the duo say. As a well-known twist on the old saying goes, ‘love is like punk: not dead’. Whatever the pair do, it’s sure to be done with passion. The result is one noisy, relentless party. Catch Vulypnes at the Dando Christmas Sessions, Fibber Magees, December 30, or at the Hot Press Tramlines show on January 15.